On Tuesday, Su Beng and I talked via Skype for the first time! With the help of his assistant Bin Hong (敏紅), he (in Sinjuang) spoke to me (in Kaohsiung). This is a crucial development- to be able to interview him via Skype. It actually worked surprisingly well since I think that Su Beng can actually hear me more clearly through the headset he wears to converse with me via Skype. During our live, in person interviews at his home in Sinjuang, I sometimes need to be reminded to "turn up the volume" since I'm a little too soft spoken. With every interview I'm more and more excited about the details I'm able to "unearth" about Su Beng's life story. I am really beginning to see how I've earned Su Beng's trust. Su Beng has been so generous with his time from the outset. When I first approached him about four years ago, I simply asked if I could talk to him about his life experiences as inspiration for a possible novel. He agreed, simply saying, "Yes, this is to further things for Taiwan." And now it has all grown into a project to document Su Beng's life. I have so many people to thank along the way- for helping to make things happen with this project. 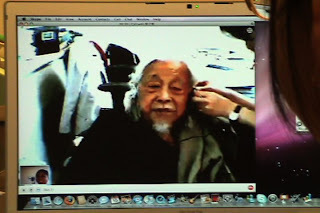 I'm planning to schedule regular Skype interviews with Su Beng as I continue working on his biography while I'm in Kaohsiung and later, after I return to New York in late May. Written by Su Beng's biographer, Felicia Lin On April 17, 2008 In "Skype"